Friday night I got to go to a blogger event at Francesca's Collection at the Gateway Mall. I had a blast AND got an outfit out of it! The button up back on my top was a HUGE selling point. I am definitely big on the details. Lets talk tights. I ripped two pairs of tights this week. OMG. Most frustrating thing ever, right?! So I stumbled upon these and they have changed my life (So much that I bought 4 colors). They are in between leggings and tights. They are thick and soft inside and, well, just all sorts of wonderful. It's Friday guys! Have a fab weekend. 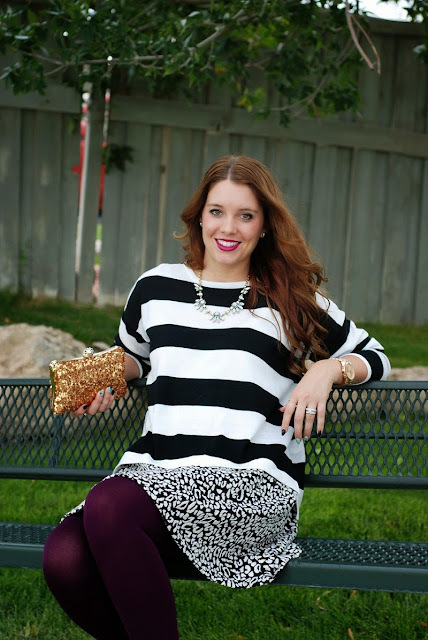 6 comments on "print on print featuring Francesca's Boutique"
I am going to need to get myself a few more pairs of tights for this Fall and Winter. I love the shorts with tights look! Absolutely love this look. I have said this many times before but you can seriously pull off any look! And... I think you convinced me, I need some of those tights! The tights really tie together the whole look! I wore my button back sweater last week and my daughter asked me if I realized my sweater was on backwards...ha! Love the pattern mixing and pop of color! Wonderfully styled :) Thank you for linking up with What I'm Loving Fridays! Come back this week for something special!